Our J is a boisterous, curious, energetic little toddler who loves his food. Not just his sweat treats and crisps, he really, really likes all his healthy foods as well. From cucumbers to berries to wholegrains to calcium-rich yogurt, he loves it all. The child even asks for healthy snacks of his own accord. So when the time came to create our very own healthy superhero for the Plum Baby Mighty Moments challenge, we decided to model him on all the things that J enjoys eating almost every day. 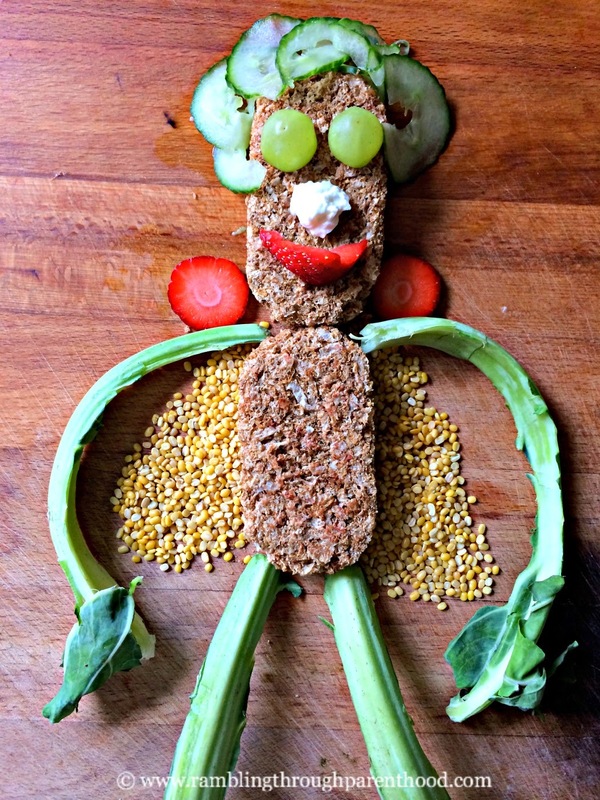 Presenting Wheat-a-Wonder, our very healthy and very strong superhero. He is made of nutritious wholegrain with curly-wurly cucumber hair. His beady eyes are grapes and he has a cheery strawberry grin. Yogurt makes his blob of a nose and he has cauliflower greens for his arms and legs. His Wheat-a-Wonder cape is made of delicious mung dal (lentils). Wheat-a-Wonder has 5 amazing super-powers too. He has super energy to play all day long without ever feeling tired. He has super concentration to sit and finish all school work quickly and nicely. He has super splash powers to swim in pools and splash in puddles whenever he wants. He has super speech that lets him ask lots of questions without ever having to stop for breath. And he has super sleep too. He sleeps in his own bed right through the night. Wheat-a-Wonder. Every parent's dream come true! This is brilliant! My son is such a fussy eater maybe I should try something like this and see if it helps! Wheat O Wonder - that made me giggle out loud - we love this super hero! !